Vital Link, Inc. has designed, delivered and installed Novec Fire Suppression Systems into numerous hush houses and test cells. This system was proposed to replace Halon, the Ozone Depleting Chemical. VLI proposed NOVEC after years of study on the unique operation environment for Noise Suppressor Systems. FSS repairs and configuration standardization upgrades are new tasking categories under the HH/NSS IDIQ contract for 2018 and beyond. 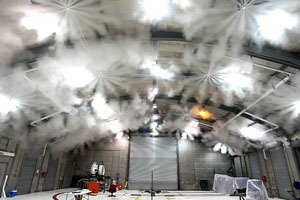 In 2011, VLI was awarded a contract for the turnkey supply, installation and first article testing of a Novec based Fire Suppression System installed in a T-10 Noise Suppressor (Hush House) at Dannelly Field ANGB AL. This project was successfully completed and delivered, along with updates to the Technical Orders and a set of proprietary drawings. This is currently the only Novec based Fire Suppression System configuration approved for use in a USAF T-10 Noise Suppressor. Atec and Celtech complement our FSS offerings with Novec systems for control cabs and subsystems. Today, we are under contract to deliver a new paradigm in test cell FSS with a super low volume, ultra fine water mist system for protection of the most advanced military aircraft. Now, joined with Atec and Celtech, both with extensive FSS personnel and experience, VLI offers an unmatched team to address test cell fire safety. Vital Link has completed the successful installation and testing of six Novec Fire Suppression Systems in T-10 Hush Houses at USAF bases—Hickam AFB HI, Hurlburt Field FL (2 each), Osan AB ROK, Kunsan AB ROK (2 each), and Davis Monthan AFB AZ. 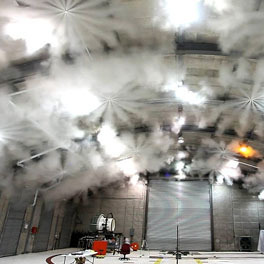 VLI has installed High Ex Foam Fire Suppression Systems at several locations in USAF, including Spangdahlem AB GE, RAF Lakenheath UK and Keflavik AB Iceland. Additional rework to these Noise Suppressors was performed. 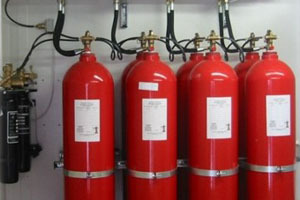 As fire systems are a life critical safety system, we typically partner with specialty fire suppression system companies, such as Hiller, Firetrol, SoFi or others. Our new affiliation with the former Astronics Engine Test Systems group (now NETS), brings us enlarged expertise for Naval/Marine Fire Safety Systems projects shipboard and onbase.